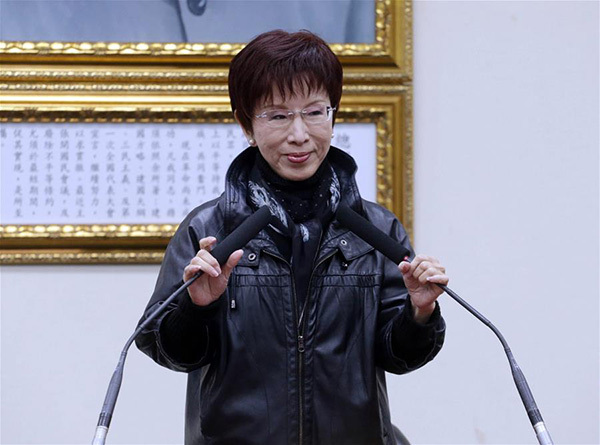 Hung Hsiu-chu, the newly elected chairwoman of the Kuomintang in Taiwan, is expected to remain on a track of peaceful development laid down by current Taiwan leader Ma Ying-jeou, mainland analysts said on Sunday. Ni Yongjie, deputy director of the Shanghai Institute of Taiwan Studies, said, "Hung has a very solid foundation of upholding the KMT's political direction and opposing 'Taiwan independence'." Hung, Taiwan's former deputy legislative speaker, beat three other candidates on Saturday by winning 56.16 percent of the votes to become the KMT's first female leader. Zhu Songling, director of the Institute of Cross-Straits Relations at Beijing Union University, said Hung has a clear stance on cross-Straits relations and the 1992 Consensus, and her election shows that upholding the consensus is still a mainstream view in the KMT. Xi Jinping, general secretary of the Communist Party of China Central Committee, congratulated Hung on her victory. Xi said in a message to Hung on Saturday that he hopes the two sides can keep the overall national interest and the well-being of compatriots in mind, and continue to adhere to the consensus and oppose "Taiwan independence". Under the consensus, both the Chinese mainland and Taiwan agree there is only one China. Xi said the Communist Party of China and the KMT should consolidate the foundation for mutual trust and strengthen communication and interaction. They should also jointly safeguard the peaceful development of cross-Straits relations and peace and stability across the Taiwan Straits and, "with one heart", strive to achieve "the great rejuvenation" of the Chinese nation. In her reply to Xi's message, Hung thanked him for his congratulations. Compatriots on both sides of the Straits are all parts of the Chinese nation, Hung said. She said she hopes the two sides can strengthen mutual trust and deepen cooperation on the basis of the 1992 Consensus. Hung will be KMT leader until August next year, taking over from Eric Chu, who resigned after a defeat in the island's leadership election in January. In October, Chu replaced Hung as the KMT's candidate for the island's leadership but was defeated by Tsai Ing-wen of the opposition Democratic Progressive Party. Tsai is scheduled to take office on May 20. In January, the KMT also lost its control of the island's "parliament" by retaining only 35 of 113 seats, losing nearly 30.